The city of New York can be pretty expensive in general, especially when practicing in “wellness”. These days, staying fit mentally and physically can wind up putting you in debt. But on an island where everything seems to be going up in cost, it’s nice to know some things are still free. Especially with National Relaxation day coming up, it’s a good time to remember that you can actually meditate in NYC for completely free and still leave your house. With fall approaching, (though I don’t know how that’s possible), it’s a good a time as any to start a brand new routine or ritual. If you’ve never practiced or tried meditation, it’s a great way to make a small change, and can take as little as five minutes a day at home. Meditation can take years to master, if at all, and while these practices have been popular for a long time now, meditation has now become a focal point of our culture. 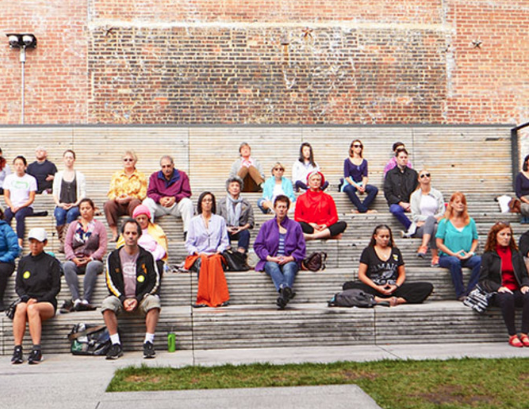 Communities, classes, and people have dedicated themselves to both mastering meditation, and teaching it’s practices. Everyone from celebrities, to entrepreneurs, wellness experts and actresses turned wellness experts thrive on their own individual daily routines for balance in a crazy world. Meditative experiences, or retreats can be expensive, and sometimes going to ‘find yourself’ might just cost you a pretty penny. All this only makes it the more exciting to know that in spite of all that, you can still walk out the door, and meditate in NYC for free. 1. I Meditate NY ‘s Breathe, Meditate, Rejuvenate workshop. One of the best parts of this large, yet small island is that no matter your passion, purpose, or forte, if you look, there are plenty of ways the city can fulfill them. If you want to do anything from watch movies, to work out, to read books, to meditate in NYC, or anywhere for that matter, Meetup.com is one of the best resources. It hosts thousands of varying groups focused on everything from culture, to fitness, movies, and meditation. The I Meditate NY group hosts weekly breathe, meditate, rejuvenate sessions on Thursdays, as well as monthly, meditation happy hours and breathing workshops. And if you haven’t crossed ” Start Meditating” off your to-do list just yet, don’t worry! The group, and classes are open to join, and occur regularly. 2. New York Insight Meditation Center’s Community drop in hours. The center, which is also a spot to meditate in NYC for free happens to be open to the community Monday through Thursday, 2 – 6 pm. 4. Self care workshops at Athleta. The wellness mega brand and retail store hosts a variety of classes in their downstairs hub including yoga, and all kinds of workouts. One Sunday, take a half hour out of your day for some self care ,and go check out their short, meditation sessions. The 20 minute class, hosted by the Path is every Sunday at 4 pm. I’ve been to a few hosted by my very good friend (and meditation teacher), and can attest to their effects on the brain and body. 5. A morning meditation on the Highline. Can you think of a better way to start a Manhattan Morning then to meditate in NYC high amongst the clouds, looking down on the bustling city below? Neither can the Highline. This summer they partnered up with the Integral Yoga Institute, and other guests to host free Tuesday morning meditation classes. The free, open classes go from 8-9 and last through September. It may be too hot right now to spend the early morning in the sun, but come fall, I can’t think of a more beautiful way to start your daily routine. It really is hard to believe that there’s anything you can do for free in New York, especially when it involves something like meditation! What a wonderful roundup. Next time I’m home, I’ll have to check these out! I haven’t heard of any of these places but they sound interesting. I’m in Westchester but I can probably find time to try out one of these. This honestly couldn’t have come at a better time. I’m committing to taking better care of my mental health and would love to try one of these place. Meditating on the Highline sounds like such a fun and calming experience. Will definitely try it! Some great little spots here in a furiously busy city. I have been to New York a few time, lovely place, but so many people who are always in a rush. It’s good to stop and take a moment. Thanks for sharing. great list have on here,thanks for sharing. I had just recently got into yoga. I want to get more confident in yoga so I can move on to meditating and zen.